Oscar Wilde photographed in 1882 by renowned portrait photographer Napoleon Sarony. 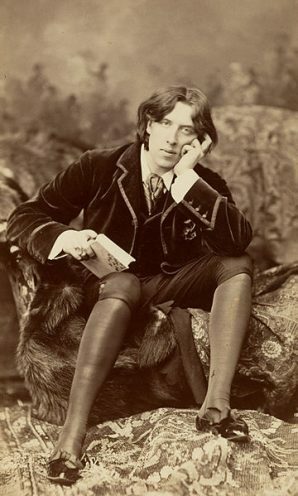 Born October 16, 1854 in Dublin, Oscar Fingal O’Flahertie Wills Wilde was a renowned Irish playwright, essayist and novelist. Wilde was the author of The Happy Prince and Other Tales, a collection of children’s fairy tales published in May 1888. The story collection includes the titular story, as well as four other tales. All of the stories contained the same wit, enchantment and folly that filled Wilde’s other work. However, the stories for children are also social critiques, with examinations of class and poverty. Before the tales were put in print, they were first told by Wilde at dinner parties, with adults as their first audience. Wilde himself described the tales as “not for children, but for childlike people from eighteen to eighty.” Another fairy tale collection, A House of Pomegranates, was published by Wilde in 1891.